Join us onboard the Rocky Mountaineer for eight unforgettable days of daylight travel through Canada's West and the Canadian Rockies. Enjoy panoramic views from our SilverLeaf cars, or even better views and on-board services from our stunning GoldLeaf dome cars. With Daylight travel only and overnight stays in the charming and moderate hotels of Canda's most cultural cities, you will experience many of Canada's greatest natural treasures including a ride on an ice explorer to discover the Athabasca Glacier. 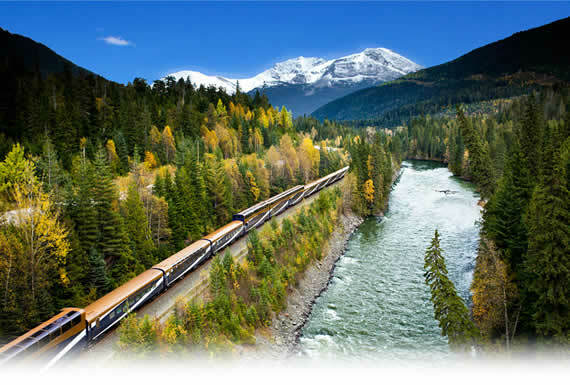 A tour on the Rocky Mountaineer has something for passengers of all ages and is an adventure you will be glad you didn't pass up. Prices are per person and are in U.S. currency and don't include taxes. Please be aware that schedules and fares are subject to change without notice.